Salmon roe is one of my favorite foods (and my husband and son share my love of those beautiful translucent little orange balls of briny goodness). And every time I post to Nourished Kitchen’s facebook page, extolling the many virtues of roe (and oh, there are many), I receive two reactions: disgust and unadulterated adoration. Of course, most of the folks disgusted by the idea of eating roe have yet to actually try it which I always find peculiar. How can you adopt such a strong and unyielding position without even minute experience? This year, we decided to spend New Years with friends at their rough-and-tumble cabin about a mile outside of town. We packed up our warm clothes and five pounds of salmon roe in their skeins to smoke for the holiday. We began first by rubbing the skeins with salt and letting them sit for a bit: this helps the skeins to contract a bit and expel some of their liquid. When the smoker was ready, we brushed off the excess salt and transferred the skeins to the wire racks where they should smoke for about thirty to forty-five minutes. At first, the salted and smoked salmon roe is overpowering; that is, you couldn’t make a meal of it on its own, but roe isn’t typically meant to be a meal on its own so much as it is a complement to other dishes, and it complements them well. It’s a seasoning, really. So we served it the next morning, on New Year’s day, over fried eggs and continued eating it at nearly every meal because it is such a remarkably beautiful food, and one that your body intelligently craves after the first taste. What we knew we couldn’t consume within the week we set into a dehydrator and dried – to be crumbled over winter squash or flash-fried kale as you might do with something like bottarga (another one of my culinary loves). I re-read Nutrition & Physical Degeneration recently. And as I thumbed through those rather dog-eared pages, cataloging exactly what the different peoples ate, it struck me that fish eggs played a critical role in the diets of the majority of peoples – even inland tribes with no easy access to the sea. Indeed, the peoples of the outer Hebrides, Alaskan natives, Native Americans of the northwest, the Melanesians, Polynesians, select African tribes, the people of the Torres strait and isolated Peruvians were all described as holding a sacred place for roe. Even those without easy access to the sea, like Peruvians living high in the Andes, went to great lengths to acquire dried roe which they reserved primarily for women (knowing that maternal intake of vitamin-rich foods helped to build the health of the next generation) and children. Roe is a potent food, and one of the top foods for fertility along with other foods rich in both vitamins and omega-3 fatty acids like cod liver oil, wild-caught fish or shellfish. A single ounce of roe, about one heaping tablespoon, contains 1086 mg omega-3 fatty acids – primarily in the forms of DHA and EPA. And if you think your ground flax and chia supply you enough, think again: the human body is notoriously inefficient at converting plant-based omega-3 fatty acids into useable forms of DHA and EPA. If you want the benefits, roe and wild-caught fish are your best choice. Beyond EPA and DHA, that single ounce of roe is also particularly rich in vitamins A, C, D, B6, B12, thiamin, riboflavin, pantothenic acid, iron, magnesium, phosphorus and selenium. It is a superfood in a way that makes trendy seeds and obscure Amazonian berries pale by comparison. To help boost fertility, my nutritionist recommends consuming roe several times a week. And it’s such a wonderful food, that I’ve no reluctance in complying. My favorite way to serve this salted and smoked roe is over eggs for breakfast where its briny and smoky flavor complements the creamy yolk beautifully. Good friends of mine, with whom we smoked this batch of roe, serve it over whole-grain sourdough crostini and sliced brie. The milder ikura (get it here) is nice in homemade sushi or even eaten by the spoonful. 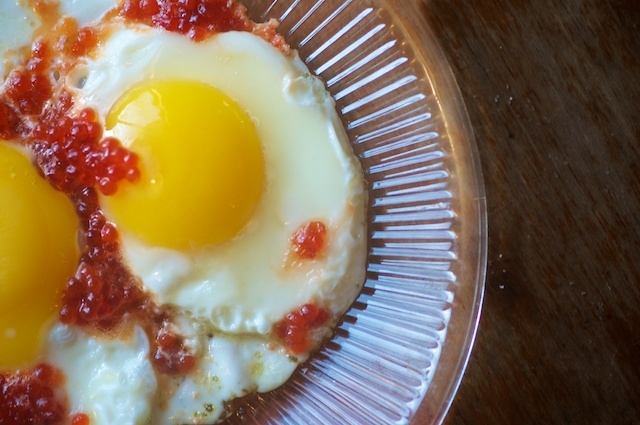 Regardless, salmon roe pairs well with eggs, cultured cream, dill and lemon or with seaweeds, fish and other seafoods. You can also use salted and smoked salmon roe in place of tarama in the classic Greek dip taramasalata. Finding fresh roe in their skeins to prepare this salted and smoked salmon roe recipe is challenging, at best. It seems few people have the knowledge or interest in eating roe or preparing their own caviar (aside from you, me and Mommypotamus) so much of the roe fishermen find ends up used as bait or thrown overboard. A sad, sad thing, no? What this means for you, though, is that unless you have an in with a salmon fisherman, chances are you won’t be able to find fresh roe in their skeins. Instead, you can get ikura or wild-caught salmon roe online. I buy it from these folks since they offer the best price I’ve seen, that is, when I’m not making my own. Salted and smoked roe is delicious, nutrient dense ingredient that can be added to many dishes. Rinse the skeins of roe in a gentle stream of filtered water (you can find a good filter here). Pat them dry and dredge them lightly in unrefined sea salt. Set them in a pan to cure for about twenty to thirty minutes while you prepare the wood for smoking. Once the smoker is preheated, drain off any excess liquid from the skeins of roe and brush off any residual salt. Transfer the skeins to the smoker. Smoke for thirty to forty-five minutes. Remove from smoker and refrigerate. Serve this smoked roe as a seasoning or accompaniment to eggs, greens or other foods. If the texture of the skein’s membrane doesn’t suit you, you may slit the skein and scoop out the roe with a spoon. I dont know where you are from but you can get all the salmon roe you would ever want by hanging around a boat launch connecting to lake michigan in the summer. most anglers would be happy to give it away to someone who would use it. Yes, its sad that most fisherman throw away roes, on the other hand, its good for someone who wants to get roe for free, just hang around dip netters or boats 🙂 like someone said already. I live in Alaska now, but i’m from Lithuania, where caviar is expensive, very valuable delicacy. I never made smoked, I shall try this summer. i make it differently, i preserve a lot for the whole winter, and even more if I know, that after fishing season we’ll visit Lithuania :). I have a post on my website where i show step- by- step how i make caviar. Thank you for this recipe! I’ve been out with wildsalmonfishers in Northern Norway and got some roe from them. I love roe and smoked food but never tried to smoke roe (as i never had it fresh between my hands before). Smoked some this evening and found it delicious! I tried your recipe and it is yummy! I’m not a fan of fishy things and my family looked at me like I was crazy, but these were delicious! Thanks. catch lots of Salmon in Alaska-how can I preserve the roe (freeze?) for weeks or months? 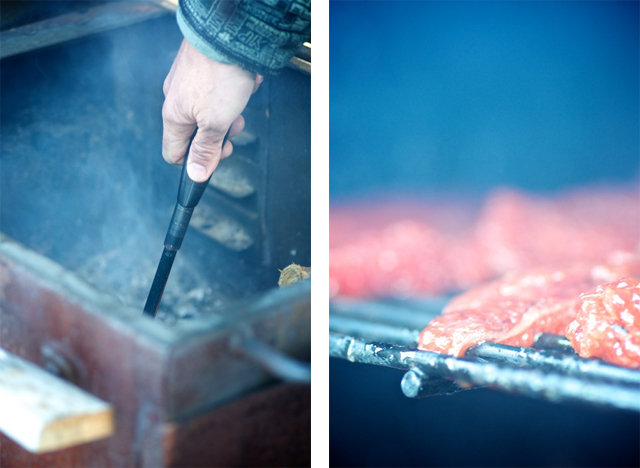 Our camp has a freezer, electric, and cooking facilities. My husband just made a batch of this salted and smoked salmon roe. I t is delicious. It was a little salty, but that can be adjusted next time. I can see using this as a seasoning for a lot of foods. I’m going to try and dry a few skeins and see how they turn out. around what temperature were you smoking the roe? I am about to smoke some and am using an electric smoker. You will want to cold smoke the roe if you want it to remain caviar-like. If you are in Alaska or similar climate, this probably will not be difficult this time of year, even with an electric smoker. I played around with smoking roe this summer, and I found that cold, wet days produced the best quality. Warm, windy days were challenging. The roe would dry out (which is delicious also, but not always the goal), and the smoke was pulled out of the smoker by the wind (I used a 4’x7’x8′ smokehouse with an electric skillet full of alder wood chips on the floor and the roe elevated and situated at the opposite end of the smokehouse to stay away from the heat). Also, to achieve more consistent roe, you may want to remove it from the skein before salting and smoking it. There are various ways of doing it…. mine is secret =) If you do remove the eggs from the skein you will have to smoke them on something very fine. I spread my eggs out on coffee filters. The eggs remove pretty easily when you are done smoking. Any that stick will come off if you swipe the underside of the coffee filter with a damp paper towel afterwards. A small screen like a frying splatter guard would work well too, I bet. Thanks for giving me a way to use the roe. I also live in Alaska, and we got a lot of roe this summer but I need up giving it to a friend for her sled dogs because I didn’t know what to do with it. Next summer will be a great treat! I am looking to order some in about a week or so, and was just wondering, for the roe that comes in jars from the link you gave us: if I get a 4-oz jar of roe, how do I preserved it once opened? I presume it is shelf-stable to begin with (?) but how long will it keep in the fridge once opened? There are only two of us in the house, and this would probably be a weekend treat for the most part, so don’t see burning off a jar in a few days. Just wondering if I could freeze half a jar if need be. I think it’ll keep about a week, opened, but it freezes REALLY well. I’m from Russia and I love, love, love caviar. Any kind – red, black, white. My favorite way of eating it is an open faced sandwich for breakfast – your favorite bread, really good unsalted butter and plenty of caviar on top. My kids love it too, although my 1 y.o. son loves to pick just the roe and leave the bread. Or instead of bread put it inside freshly made crepes. But I try to buy only “raw material” as they call it – which are 1kg frozen packages of salted roe. This way you know you’ll get just salted roe and no additives. Most canned salmon roe contains preservatives and is a mix of 1st grade roe and not so good quality roe. If you live in Seattle area there are lots of companies that bring roe from Alaska and is fairly priced. I prefer to buy 1st grade chum salmon caviar. Here are some of the companies, btw most of them do ship, but shipping isn’t cheap. What if you don’t have a smoker? I have a friend that fishes all the time and is willing to give me the roe, but I don’t have a smoker. Could this be done in the oven or a gas grill at very low temperature? Thanks! I go to Alaska every year and fish the Kenai river for Sockeye salmon. When we filet them out we throw away as much as 10 pounds of roe. I would like to know how to preserve it to last 6 or 8 months or longer. I recently saw a TV celebrity tasting seafood at an Alaskan Native Village. One of the Elders had a jar of “smoked salmon roe” and the celebrity said it was very good. I’m looking for detailed recipes on how to preserve/smoke/dry/can salmon eggs. I need salmon egg preserving 101 with as many details on times, temperatures, wood etc., anything that will help me. All I see is the salmon roe we would harvest from female fish to catch more fish…. Great article! I catch a lot of Steelhead in the Lake Erie tributaries of Ohio and Pennsylvania when they spawn. Steelhead are a strain of Rainbow trout that are originally from the Pacific West coast and like Salmon come in from the ocean and spawn in the rivers. Unlike Salmon, Steelhead will return to the Ocean (or in my case, the Great Lakes). Anyway, they are very similiar to Salmon and the roe looks the same except the Salmon eggs are a little bigger. I usually reuse the roe for catching more fish, but I have been wanting to try eating the roe, but really didn’t know how. I will definitely give it as try now. I never thought about smoking it. I did go Salmon fishing this year near Traverse City, MI. We were going to save the eggs and do vodka shots filled with Salmon eggs, but we forgot and discarded all of the eggs we got back to our rental house and cleaned the fish. Next year I will definitely save the Salmon eggs. I heard of a salmon roe recipe once, and it was called Indian Cheese. It looked like smoked salmon eggs that where crushed and canned. It resembled a thick jam. Do you know of such a recipe? I want to make this in the worst way, and figured before I trial and error, I would check for information…Thanks! Hi! So I am one to love trying new foods and usually love all types of seafood including raw oysters etc. I was really surprised that I wasn’t crazy about the salmon roe… But I want to keep trying. When you eat it with fried eggs do you cook it with eggs or just top the eggs after they are done cooking? Thanks!! At what temperature did you smoke them at? A hot smoke, or a cold smoke? Extremely inspiring! How lovely to smoke the roe yourself, now I am on the hunt for some roe and I can imagine will be as hooked as you when we yet some. I love the way you have used it with the eggs, great ideas, thank you. As a fisherman the only thing I ever did with roe was cure it in borax or slightly boil them and make ‘roe bags’ to catch more trout and salmon. Thanks for the recipe, it was like a party in mouth. Thank you for the interesting recipe even as I wince just a little inside when I think of the purity of those little joy bombs being altered in any way that might detract from the explosive nutrient pop-crunch that makes roe so distinctive in all the universe as I so far- know it…. 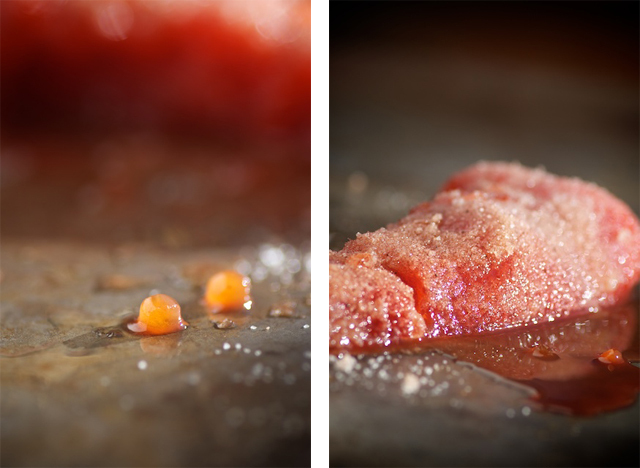 Could you use trout roe in place of salmon roe in your Salted & Smoked Salmon Roe recipe? Yes, I think so, though I haven’t tried it. Would you be willing to share other sources that might not be as expensive? The prices at Vital Choices seem astronomical. Vital choice is the only place I’m aware of that offers it online. There was another company, several years ago, but they’re now out of business. Roe is exceptionally difficult to separate and cure, hence its expense. What temperature do you smoke at? I first learned about this from an Aleut native I fished with in Kodiak AK. He wrapped Skeins in foil, added butter salt, pepper and we ate them. To this day,30 years later. I keep all the skeins. They are best consumed fresh. I have tried freezing ,but the flavor changes. I boil them lightly to the consistency of soft boiled. Strain them, add salt pepper and butter and eat the whole bowl…excellent. Sometimes I wrap them in Nori with brown rice and eat burrito style. I will have to try the afformentioned cold smoke-sounds delicious. It is true, they are addicting. If it`s a dark spawner, such as a chum, cut the eggs out and don`t use the fish-or bring the fish home and cook it for dogfood. Can salmon roe be canned? I’m not certain. I imagine it can be pressure canned. Traditionally it would have been dried as a method of preservation.